Simple, familiar, and predictable—all things that could have been avoided with a deeper understanding of the story’s thematics. Light, airy, and full of 80s charm, Edie the Eagle reminds us of what it means to be inspired by dreams. 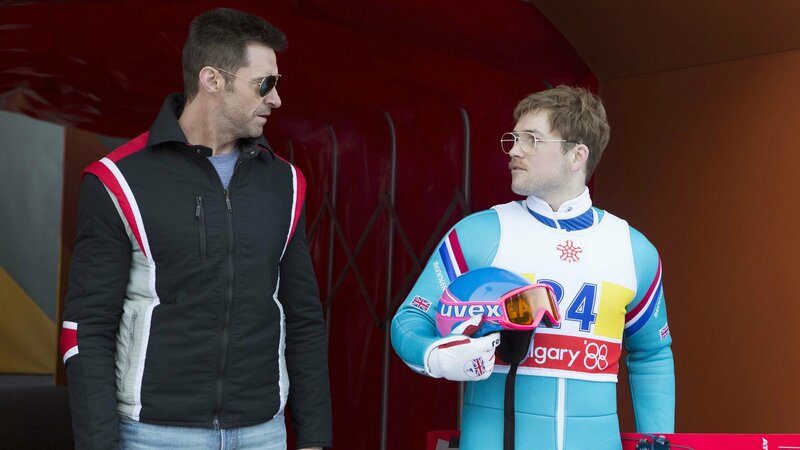 To simply recount the journey of Eddie “The Eagle” Edwards (Taron Egerton) from plasterer to Olympic ski jumper would leave us feeling informed, yet unconvinced. To turn his life’s journey into a complete story and thus—a functional argument for the power of determination—required the introduction of a completely fictional character: his coach, former skier Bronson Peary (Hugh Jackman). Unfortunately, Jackman’s character is cliched: the down n’ out former champion turned to drinking and bar fights to hide from his pain. This “archetype” of character explains the familiar feel to the film. But his character is absolutely essential towards the creation of a Grand Argument Story. Main Characters need an Influence Character to challenge them and give them a reason to grow. Peary fits the role perfectly. Peary’s problematic Fixed Attitude challenges Eddie’s own Situation and the fact that the young man lacks the physicality to compete. Peary’s Impulsive Responses, or complete lack of freaking out when it comes to ski-jumping challenges Eddie and his apparent backwards Progress through every trial. And it is Peary’s firm belief in the Unproven— a belief that matches pretty much everyone else Eddie runs into—that works against Eddie’s sense of Determination. …would give the filmmakers an opportunity to create a new and unique character for Eddie to face. Intuition often relies on experience and here we see evidence of the Authors intuiting that they need this kind of character for Eddie, but don’t know exactly what the specific elements are that constitute that kind of character. As a result they fall back on the tried and true and give us something we have seen before. The predictability of the film lies more in the use of this character type rather than anything to do with the actual structure of the story. Unproven drunkard has-beens inevitably end up Proving themselves. Using our technique of Dramatic Playgrounds to brainstorm and invent a wholly new concept of character, the filmmakers could have isolated this problem and improved the narrative significantly. As uninspired as Jackman’s character is, the Relationship Story Throughline between Peary and Eddie—also an essential element of a complete story—lacks thematic depth. While the Domain of their conflict is correct in exploring different Manners of Thinking, their Relationship fails to dive deeper into the thematic material necessary to give the narrative emotional breadth. You can see more of these elements at work in the relationship between Eddie and his father. Peary does act as a bit of surrogate for his father’s influence, thus making this film a good candidate for a hand-off situation in regards to the Influence Character. But again this is the easy way out when telling this story. The Unending conflict between a father and a son and a son who doesn’t want to follow in his father’s footsteps? Familiar and predictable once again. Their conflict will come to an End eventually. That said—the film still acts as intended. It inspires and successfully argues that you can do anything you want to do, as long as you have the determination and same Steadfastness that Eddie the Eagle did. With the introduction of a tried and true Influence Character, the filmmakers behind Eddie the Eagle gave us a simple, familiar, and predictable narrative. Simple in that there is little depth to a Relationship Throughline that effectively bookends the narrative. Familiar and predictable in its application of the first thing that comes to mind when creating an Influence Character for Eddie. Eddie the Eagle is light and fun and enjoyable on a Saturday afternoon with the family. The lack of dramatic depth demands little attention while the functional storyform ensures the experience is not a waste of time. Eddie the Eagle inspires, but inspires the way so many have before. The film functions as a perfect example of how a deeper understanding of a story’s thematics can make it possible for storytellers to inspire on a whole new level.